Devil's club leaves painted by autumn. ...I realize that I haven't shared enough summer photos with you! So here is a mish-mash of fun stuff. A bumblebee working red clover. Picking medicinal plants in the muskeg. My sweetie took this picture. Grouse. A bird that Harold so eloquently notes is "cursed with deliciousness." Taking a skiff down to the boat on a dock cart. Paddle-tailed darner dragonfly (Aeshna palmata) in flight. What wonderful gems of the air dragonflies are! Red and yellow and turquoise - oh yes, I love the turquoise! These four-winged fliers are a joy to watch as they patrol territory, hunt, and interact with other dragonflies. Today I stood quietly in the moss near a tiny pond, watching, and trying not to swat at mosquitoes. Water striders prowled the surface of the pond and whirligig beetles spun underwater. It was sunny and warm. A moth flew up out of the moss just two feet in front of me, and a dragonfly whizzed past, grabbing the moth on its way! The efficiency of the strike amazed me, and I am pretty sure that I heard the small 'crunch' of the moth in the dragonfly's jaws. Dragonflies don't bite humans, but they eat a lot of bugs that do. The Four-spotted skimmer dragonfly (Libellula quadrimaculata) perched on a Sitka burnett stem. Female four-spotted skimmer laying eggs. 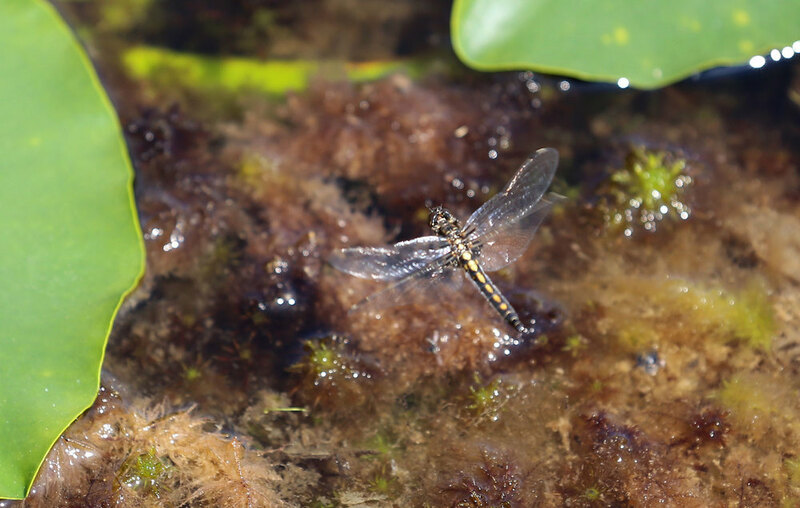 Okay, the photo to the left is fuzzy, but it is a female four-spotted skimmer laying eggs in shallow water. She flew just above the water, dipping the end of her abdomen into the water to deposit her eggs. Four-spotted skimmer on an old grass stalk. We usually just see the adult phase of dragonflies, but they are really aquatic insects. Some species hatch, grow, and change into their adult form in one year, and other species spend years living underwater in the larval stage. They emerge in the summer, and many only live a month or two as adults. I am always amazed when dragonflies hover like helicopters, fly backwards, or lift straight up while holding their body horizontal. The trick behind this is that their forewings and hindwings move independently. The forewings are usually up when the hindwings are down, giving the dragonfly tremendous maneuverability. Dragonflies can even fly sideways! Below is a Hudsonian whiteface that appears to be contemplating a spider on a web. Hmmm, the spider and the fly...? Hudsonian whiteface dragonfly (Leucorrhinia hudsonica) perched on a yellow pond lily leaf, facing a spider. Don't you just love the way dragonfly wings glisten in the sun? The Hudsonian whiteface really does have a white face. Hudsonian whiteface dragonfly on a buckbean leaf. Hudsonian whiteface dragonflies (Leucorrhinia hudsonica ) in the tandem position. You may be wondering what these two are up to. Okay, the male is in the front, and he is grasping the female's head with special appendages on his abdomen. They are in what is called the tandem position. This pair is not mating....yet. No X-rated bug photos today, folks. Nearby a darner dragonfly was pushing her eggs into the mud at the edge of a pond. There are several species of darners that look similar, and I could not be sure of which one this was. Darner dragonfly laying eggs in the mud. I drove to Pat's Lake to see what other species of dragonflies I could find. The paddle-tailed darner below flew back and forth along the edge of the lake. Darners are more flyers than perchers. They flew continuously while I was at the lake. Paddle-tailed darner dragonfly, landing gear retracted, in flight. Isn't Pat's Lake a beautiful place? In mid-summer Pat's Lake, near Wrangell, is a good place to watch dragonflies. Dragonflies and damselflies are both in the order Odonata. Damselflies have a slender abdomen and their eyes are set far apart on their head. Many species of damselfly fold their wings above their body when they perch. I heard small wings rattling in the grass, and turned as this female damselfly perched on a blade of grass. After mating, the pair below stayed in the tandem position. They flew to various pond weeds and grass stalks and the female laid eggs. They rested momentarily on a pond lily leaf. I'll leave you with two more images of a dragonfly in flight. May you dance in the air like a dragonfly! See more inhabitants of the area! Check out the Alaskan Critters index!